If a patient has an excess amount of tissue that connects the lower and upper lips to the jaw and gum line, a frenectomy procedure is performed to remove the excess tissue. Periodontal procedures are available to lay the groundwork for restorative and cosmetic dentistry and/or to improve the esthetics of your gum line. Your teeth may actually be the proper lengths, but they are covered with too much gum tissue. Crown lengthening is a procedure to correct this condition. During this procedure, excess gum and bone tissue is re-shaped to expose more of the natural tooth. 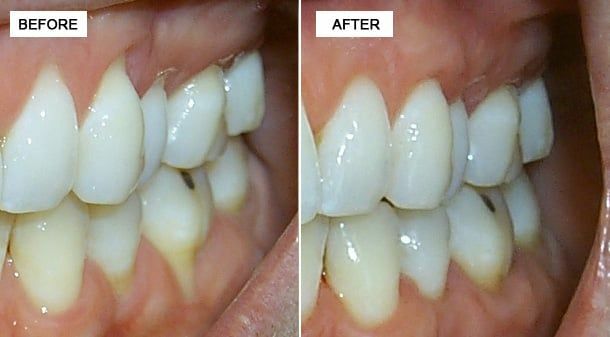 This can be done to one tooth, to even your gum line, or to several teeth to expose a natural, broad smile. Crown lengthening can make a restorative or cosmetic dental procedure possible. Perhaps your tooth is decayed, broken below the gum line, or has insufficient tooth structure for a restoration, such as a crown or bridge. Crown lengthening adjusts the gum and bone level to expose more of the tooth so it can be restored. A gum lift may be performed to create a more even gum line. Patients with a gummy smile can quickly and safely have unwanted tissue removed, thus exposing more tooth to shape a more attractive smile. A frequent periodontal condition is known as gum recession. This means the existing gum tissue has receded up or down the root of the tooth exposing various amounts of the root. Root exposure can create root sensitivity especially to hot and cold, an increased potential for root decay, and/or esthetic concerns. Gum grafting procedures are the treatment of choice to prevent the recession from continuing further. There are many different types of recession and hence many different types of gum grafting. Some are aimed at covering the root of the tooth and other procedures are focused on providing an excellent new zone of gum tissue to halt the recession. In the back of the upper jaw bone, dental implants are frequently needed. In order for a dental implant to be successful in this area of the mouth there must be sufficient bone height and width to connect (integrate) to the dental implant. When the upper back teeth are lost and not replaced, the sinus cavity becomes enlarged destroying any bone that is left behind. This very large sinus is like a "giant air pocket" and not capable of supporting an implant. A procedure known as sinus grafting (sinus lift) is performed to create bone that will ultimately hold the implants within the sinus. Sinus grafting is an extremely common form of bone grafting. Tooth loss occurs for many reasons; dental decay, root canal problems, fractures, periodontal disease and trauma. Additionally at times teeth never develop. As a result of tooth loss the bone melts away. If there is inadequate bone to support surrounding teeth and future possible dental implant(s), bone grafting materials are used to rebuild and regenerate the bone providing sufficient bone in quantity and quality for implant placements and supporting tooth structure.